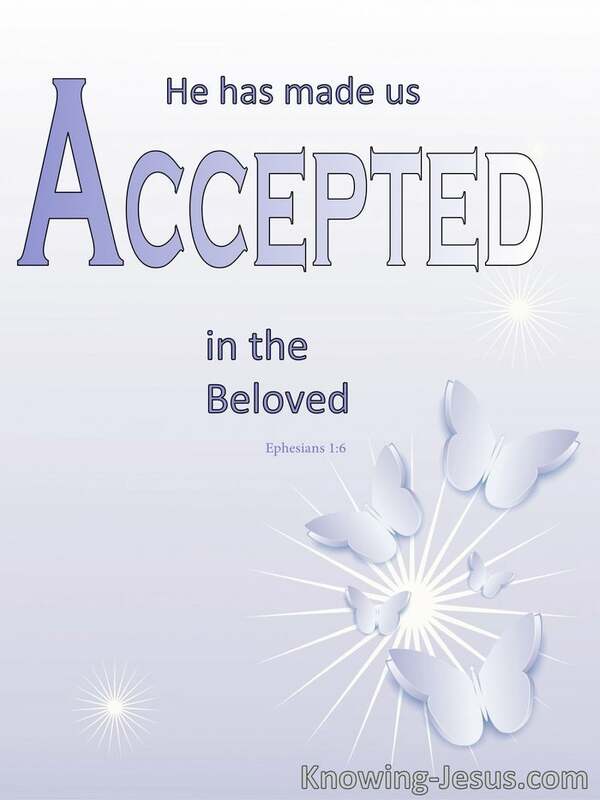 There is only one basis of acceptance by God.. and that is “accepted in the Beloved”. Seeking and striving to please God is of no effect to Him. He cannot accept that. His satisfaction rests entirely and only upon His satisfaction in His Son, Jesus Christ. He looks at you and sees Jesus in you.. and is satisfied with you for no other reason, He looks at me and sees Jesus in me.. and accepts me for no other reason. God is fully satisfied and accepts both of us – on behalf of His well-beloved Son – for there is no righteousness in us except that which comes from Him. This is a two-way process. His satisfaction in us, reflects in our satisfaction too. And it is futile to try to research ways to please God, as there is no way. Once a soul can truly rest in this truth.. he can rest in God’s gracious love and acceptance. But too often much time is wasted, seeking ways to get God’s acceptance.. and peace and joy, and rest of the soul is forfeited, as one labours to find ways to please a God, considered to be unapproachable. But He is approachable – BUT approachable ONLY through Christ, for we are accepted in the Beloved. Countless saints of God have taken many years to learn this principled truth. The Holy Spirit takes us to the point where we eventually recognise what we are. We are nothing without the Lord Jesus. We can do nothing without the Lord Jesus. 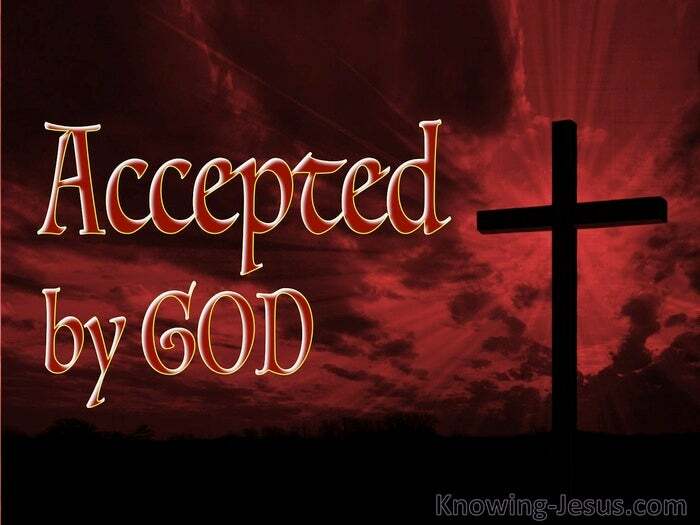 We never have and never can be accepted by God apart from the Lord Jesus. This is not the acceptance of the sinner saved by grace. This is the acceptance of a child of God – one being conformed into Christ’s-likeness.. and sometimes it is hard… sometimes it is very hard. One salty saint of God explains it this way: he wrote:- “This is how the Holy Spirit reasons: He shows us what we are – and that is one reason why He often seems to be very hard, and does not give peace to the soul, as we are not relieved until we experientially, from our hearts, acknowledge what we are. Until the soul comes to that point… the Spirit of God does not give it peace – He could not; for it would be healing the wound slightly. The soul has to go on until it finds that there is nothing to rest on except the abstract goodness and grace of God; and then… ‘If God be for us, who can be against us?” Romans 8:31b.? How sad in this topsy-turvy failing sinful world – the opposite is often believed! When things are jogging along smoothly the believer thinks God is blessing him.. and it may be true for all good gifts come from the Lord. But when life gets tough and difficult, then that same believer thinks God is displeased. Nonsense… His love and acceptance is the same yesterday, today and forever.. for your Acceptance is IN Christ and in Christ alone. You are accepted, not for what you are, nor rejected for what you are. You are accepted for ever and forever – accepted in the Beloved. But the truth is that most of our spiritual development comes through such trials. There is nothing we can do or say to be accepted in the eyes of God. There is nothing we can do or say to lose His acceptance of us – but in everything we always are and always will be accepted in Christ. There is nothing you or I can do or say to commend ourselves to God. There is nothing you or I can do or say to receive His condemnation.. but in everything we are and always will be accepted in the Beloved. This is a fact upon which our entire joy in believing must rest. This is a reality upon which our faith in God must stand day by day. Acceptance is all His grace. Thank God for His grace.